For those of you who are new to polo, the Cascade Polo Club is pleased to offer this brief introduction to the basic rules, strokes and strategy of the game of polo. It takes two heads, six legs, and two arms to ride a horse and play polo on a field that is 15 acres in size, 300 yards long and 200 yards wide, or the area of 12 football fields. It is a fast, fluid game where the player holds a mallet in the right hand only, striking at a 3 1/4 inch light plastic ball that weighs 4 ounces on both sides of the horse. When well struck, the ball can travel over 100 yards in the air, at 100 miles per hour! In polo, eight players on eight horses combine athletic riding in English saddles, amazing hand-eye coordination at speeds approaching 40 miles per hour, and a keen sense of timing and anticipation in trying to win a game by scoring more goals than their opponent. Two underlying concepts govern this game: The first is that polo is a team sport with each player filling a specific role and supporting the team effort on both offense and defense. The second is the all important “line of the ball.” This is the imaginary line the ball creates after being struck and includes both the path that the ball has traveled, and will continue to travel. The line remains set until the ball is struck by a player, or changes direction with a carom, and a new line is immediately formed. The “line of the ball” determines which player has the “right of way” and may safely hit the ball next. A player may cross the line only when it does not create danger of collision with another player. Two mounted umpires and third sideline referee oversee the game and enforce the rules. Infractions generally involve crossing the line of the ball, hazardous riding, and dangerous use of the mallet. When a foul occurs, a free hit towards the goal is awarded to the team that was fouled. When two players ride to the ball, both hoping to hit it, they must ride on either side of the line so both have equal access to the ball. The players will use their horses to “ride off” an opponent to push them out of the way to gain the right-of-way. A “bump” is a defensive tactic that occurs when two players come together at different angles at speed and try to bump each other off the ball with their horse’s shoulders. Scoring is accomplished by putting the ball across the goal line between 2 goal posts 24 feet apart. There are usually 6 periods in a polo game, 7 minuets each, and each period is called a “chukker”. Most players try to use a fresh mount for each chukker, but oftentimes the best ponies are asked to go twice in a game. 4 minutes are allowed between chukkers to change horses. 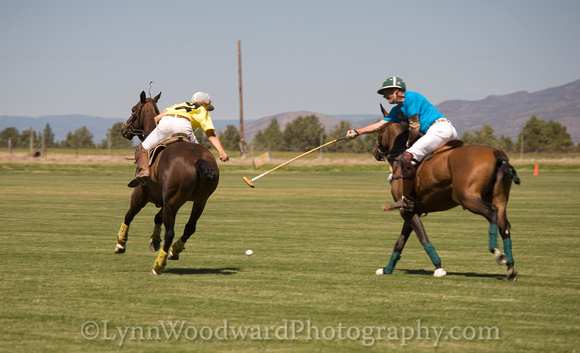 During the 15 minute half time, spectators are encouraged to roam the field replacing divots, adding to the social side of a polo game. The pivotal player on the team is the #3 as he must stem the opponents’ offense, then turn the play to the attack, and pass the ball up field to his #2 and #1 as they turn to press the penetration toward the enemy goal. The #1 plays towards the front of the attack and looks for opportunities for scoring, but also has the defensive responsibility of “marking” the opposing #4. The #2 needs to be well-mounted as he supports his #3 on the pivotal plays, is a play-maker that advances the attack quickly and relentlessly, as well as defensively hassles the opponents’ #3. The #4 is primarily responsible for defending his team’s goal, and tries to neutralize the opposing #1. These assignments are not rigid, however, and each player must be prepared to mark any play that will benefit his team, temporarily changing positions as the play develops. The Cascade Polo Club and the Pacific Northwest’s polo community are grateful for your interest in and support of the sport and for the opportunity to present polo to you, the discerning spectator. The Cascade Polo Club looks forward to seeing you when we offer polo matches throughout the summer. While attending a match, feel free to ask questions about polo at the announcer’s booth, so the announcer can explain the rules, tactics, fine plays and fouls to the audience!